If pumpkin pie and pecan pie had a love affair and created a baby, it would be this Pumpkin Pecan Pie Bites – perfect for a Thanksgiving get-together. I don’t know why that little summary made me think of An Affair to Remember. I wonder if Cary Grant and Deborah Kerr were pumpkin or pecan pie fans. At my house, there’s a clear divide between pecan pie and pumpkin pie fans. Me, I’m not really a pumpkin pie fan or a pecan pie fan. But the combination of these two together is the perfect holiday treat. 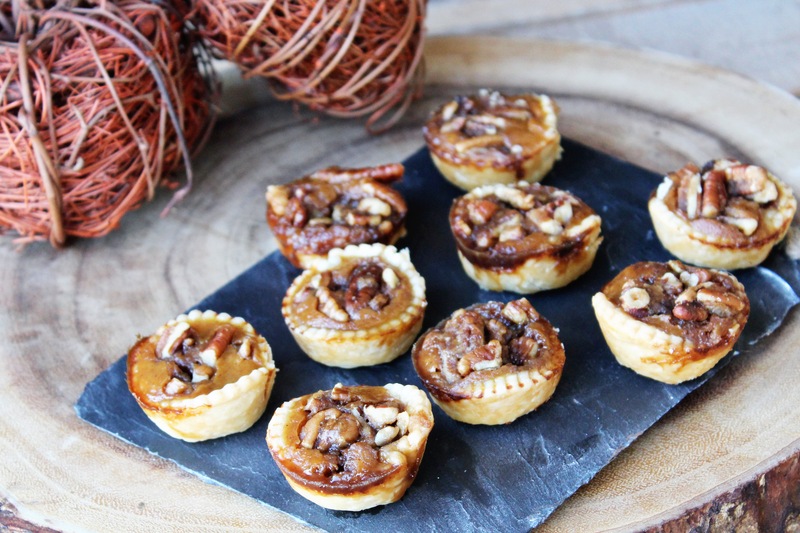 You get the hint of pumpkin with a bit of sweetness from the pecan filling. We are a very traditional family when it comes to the holidays. Every year we have the same thing at the dinner table. For the past several years I’ve been trying to help my mamma out by taking over some of the cooking duties. However, one thing she won’t give up is making desserts. And I’m ok with that because her pies are the bomb dot com. Seriously. But I do try to make a little something extra for my dad because he enjoys every single thing I make him. When I go home for a visit I always try to make him some treats to take for him to try. He and my mom crack me up because I’ll ask if they shared what I brought them with anyone and my dad will have taken one, yes one, piece of dessert or tamale or whatever to a friend and my mom will take one bite to one of my aunts. Stingy. But they love me and want all the stuff I make for themselves. Can’t blame them. Ok, so now the recipe for your Thanksgiving dessert. This makes 96 pie bites so you can do what I do and save half of the pie filling and freeze it for later. 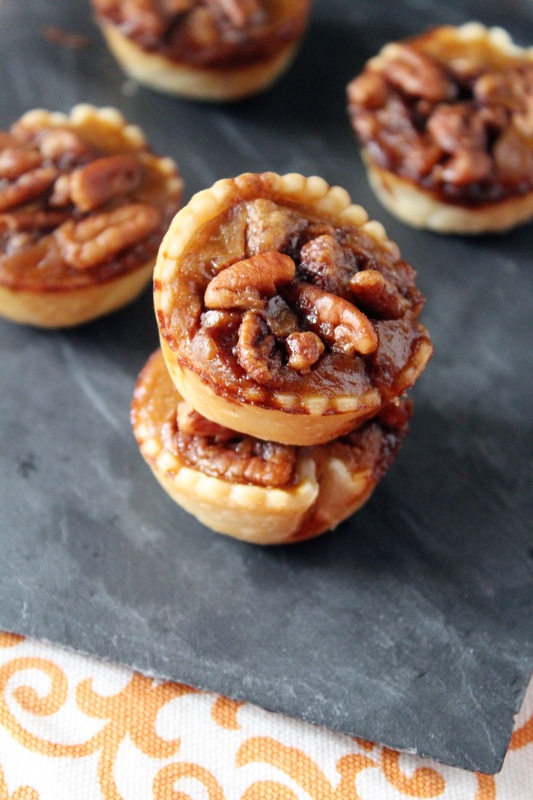 Then just cut the pecan part in half and you will get 48 mini pie bites. Enjoy! 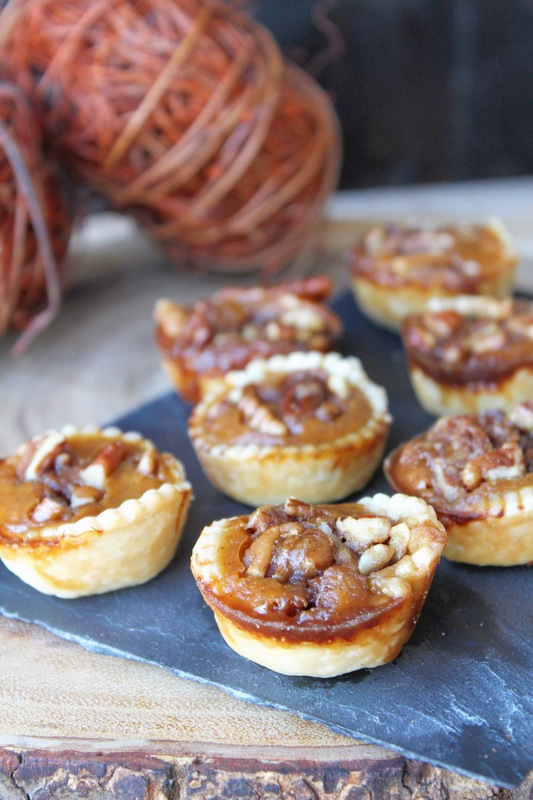 Pumpkin Pie and Pecan Pie merge to make this perfect Pumpkin Pecan Pie Bite for Thanksgiving. Prepare pie filling by adding pumpkin through salt ingredients to a medium mixing bowl. Roll out pie dough and take a medium biscuit cutter to cut pie dough into rounds. Spray 24-count mini muffin tins with cooking spray. Fit the dough into the muffin tins and form into a crust. Fill the tins about 3/4 full. Prepare the pecan filling by mixing together the pecans through the maple syrup together. Take about a heaping teaspoon and place on top of the pumpkin filling. Bake in the oven for 21-23 minutes or until dough starts to turn brown. Once the pie bites are out of the oven, loosen them with a toothpick to make it easier to remove them once cooled. My two favorite pies in one! Yum!